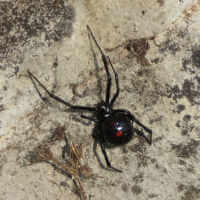 Spiders are a large group with approximately 2,500 species. 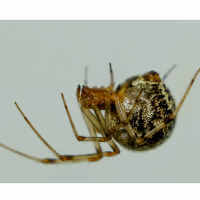 The bodies are divided into two regions, the cephalothorax (head and thorax are fused to form one region) and the abdomen. The mouthparts, eyes and legs are all located on the cephalothorax. Typically there are 8 eyes, but many species have fewer. The abdomen is unsegmented. 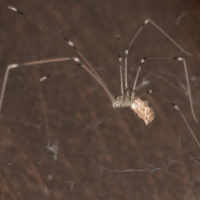 The spinnerets, which are used in creating silk, are located at the tip of the abdomen. 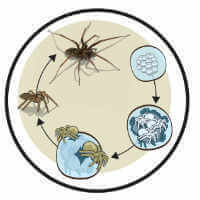 Life Cycle - Most spiders form egg sacs made of silk and go through direct development. When they emerge, usually by chewing their way through the egg sac wall, they are second-instar spiderlings and appear as miniature adults. The spiderlings go through several molts until they become adults. Many female spiders care for their young by carrying them on their bodies or feeding them, though some disperse immediately. Most spiders live one or two years, but female tarantulas have lived 20+ years in captivity.